If you hide your smile in photos or you’re just unhappy with the way your teeth look, Renu Dental can help. We offer a wide range of cosmetic dentistry services to give patients the picture perfect smiles they deserve. Look and feel your very best with advanced treatment from the trusted Crookston cosmetic dentist, Dr. Jaclyn Jensen. We offer a range of treatment options to meet any need form simple teeth whitening to porcelain veneers and even Botox all in our comfortable, convenient dental practice. Contact our team to find out more or schedule a cosmetic dentistry consultation today. Patients who have a number of chips, cracks, uneven spaces between teeth, and stains may want to consider a simple effective treatment that can conceal any number of flaws seamlessly – porcelain veneers. Custom crafted from high quality materials, veneers are thin sheaths of porcelain that are fixed to the front surfaces of teeth essentially transforming patients’ smiles instantly. The process is simple. A small amount of surface enamel is removed to allow the veneer to lay flat within the natural smile line. We then capture impressions that are used to craft a custom veneer. In the meantime, we protect patients’ teeth with a temporary veneer. Once the final product is returned to our office, we exchange the temporary for the custom porcelain veneer. For many patients, direct bonding is an alternative to porcelain veneers that doesn’t usually require the removal of tooth enamel to complete. Using tooth-colored composite resin filling material, we quickly and comfortably correct or conceal a number of flaws leaving patients with a flawless smile in just one visit. In most cases, direct bonding can be reversed if patients change their minds unlike porcelain veneers which are permanent. Most patients who choose direct bonding to repair their smiles don’t even need local anesthesia. 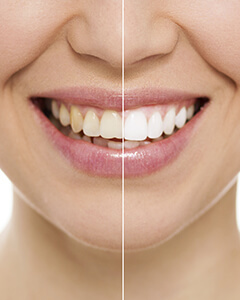 Over the counter whitening products promise dramatic results, but they are rarely able to deliver even minor improvement to the appearance of patients’ smiles because the dose of whitening agent is too low and the one-size-fits-all application trays are not adequate to keep neutralizing saliva from counteracting the whitener. Our kits include custom crafted application trays and professional grade whitening gel that brightens smiles over the course of about two weeks of application. It might not ever occur to our patients to visit the dentist for Botox injections, but with our years of advanced training understanding the inner workings of the oral and facial structures, dentists are actually the ideal medical practitioners to offer these services. These injections are carefully placed to help decrease unconscious muscle movements that lead to fine lines and wrinkles for six or more months at a time. Botox treatment can be quickly completed in less than an hour, and dramatically reduces the appearance of wrinkles.